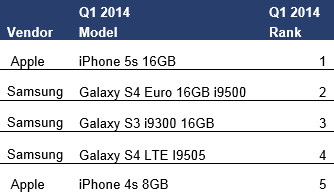 Samsung and Apple account for the majority of the top 20 smartphone models sold worldwide in Q1 2014. Heavily marketed flagship devices like the iPhone 5s 16GB and Samsung’s Galaxy S4 i9500 16GB top the rankings. “Samsung’s dominance is driven by its market leading 27% market share and despite Apple’s lower market share its small, clearly tiered portfolio creates significant volume for just a few SKUs,” commented Nick Spencer, senior practice director, ABI Research. Sony, LG, and for the first time, Xiaomi make up the rest of the top 20, with Huawei dropping out. “The much talked about Chinese vendor Xiaomi’s top device by shipment volume is the Redmi, which is now available outside of China, at a very affordable $130,” added Spencer. The other smartphone vendors are struggling to compete with Apple and Samsung’s huge flagship device marketing budgets, both above the line and in channel. ABI Research expects Huawei and HTC to bounce back in to the top 20 after the launch of their flagship devices the HTC One M8 and the Huawei Ascend P7 in Q2 2014. “The presence of the Samsung Galaxy S3 i9300 16GB and iPhone 4s 8GB in the top five is testament to the enduring appeal of these models and the vendors strong brand, enabling a long and profitable lifecycle, that other vendors can only dream of,” finished Spencer. These findings are part of ABI Research’s Smartphones and Handsets Market Research, which includes Research Analyses, Market Data, Insights, and Competitive Assessments. ABI Research provides in-depth analysis and quantitative forecasting of trends in global connectivity and other emerging technologies. From offices in North America, Europe and Asia, ABI Research’s worldwide team of experts advises thousands of decision makers through 70+ research and advisory services. Est. 1990. For more information visit www.abiresearch.com, or call +1.516.624.2500.